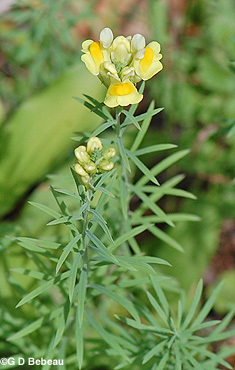 Butter and Eggs, Linaria vulgaris Mill. Butter and Eggs is an introduced and now naturalized perennial forb growing on a mostly smooth stem 1 to 2 feet high with little branching. 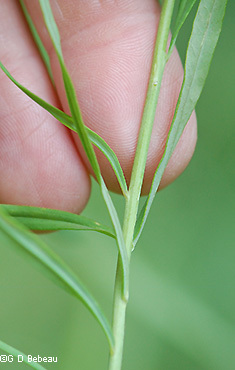 Stems are thin. Leaves are many, alternate, linear, about 1-1/2 to 2 inches long, pale green on top, smooth, without teeth and taper to a base that looks like a very short stalk, but is just the leaf base joining the stem. 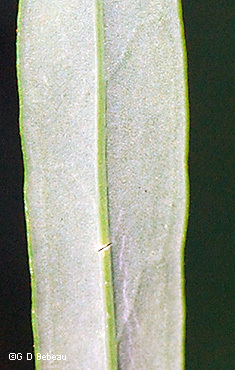 The underside of the leaf is much paler in color due to very fine surface hair. The mid-rib vein is concave on the upper side and convex on the lower side. The inflorescence is a compact spike-like raceme at the top of the stem. A stem can have 15 to 20 flowers, which are placed alternately around the stem - more spaced in the lower part of the inflorescence, tightly bunched near the top. Flowers: The irregular 5-parted flower has a nectar spur on the bottom, or rear, of the corolla. The erect upper lip has 2 lobes and the lower has 3 lobes, one of which forms an orange-yellow obstruction to the throat of the corolla. This particular lip only turns color as the flower matures. Each flower has a small green calyx with unequal lobes and sits erect on a short stalk to the raceme. At the base of the stalk is a leaf-like small green bract. Seed: Not all plants in a colony flower but those that mature produce a ovoid seed capsule that contains numerous small winged seeds that are dispersed by the wind. Because of the closed throat of the corolla it takes large pollinators to get in, such as the Bumblebee. Habitat: A plant of the roadsides and waste areas. It is invasive. It grows from a tap root and spreads vegetatively via lateral roots (rhizomes). Small root fragments of 1/2 inch will produce a new plant. Seeds are viable for up to eight years. 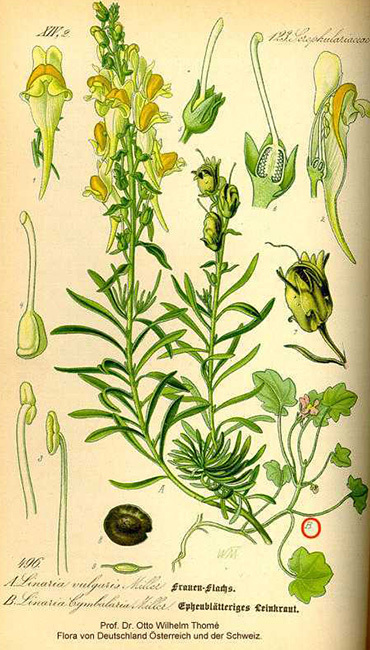 Names: The genus name, Linaria, is from the Greek linon and the Latin linum and refers to flax as in this plants flax-like leaves. The species vulgaris is from the Latin meaning 'common'. The author name for the plant classification - ‘Mill.’ refers to Philip Miller, Scottish botanist (1691-1771) who was chief gardener at the Chelsea Physic Garden and wrote "The Gardener's Dictionary". 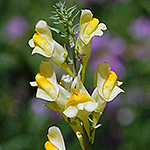 Recently botanists have moved the Linaria genus from the Figwort (Scrophulariaceae) family to the Plantain family. 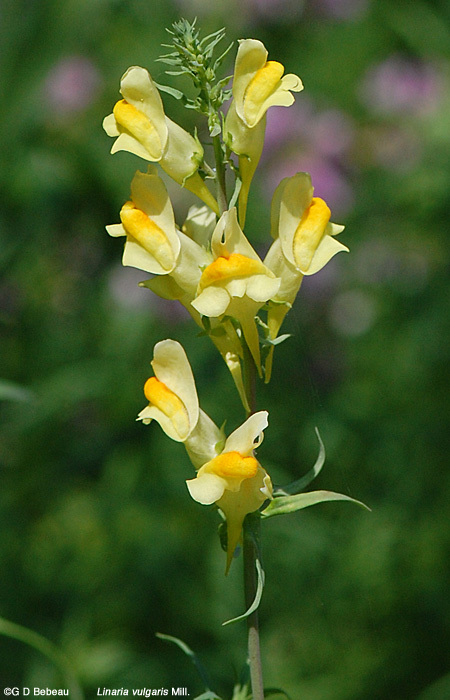 Comparisons: One of few plants with similar looking flowers is Dalmatian Toadflax, Linaria dalmatica, but there the flowers are larger and leaves are much broader and more triangular shaped. Above: The Inflorescence - 1st photo showing mature flowers, 2nd photo - flowers developing. Note the erect flower stalks, each subtended by a small bract. 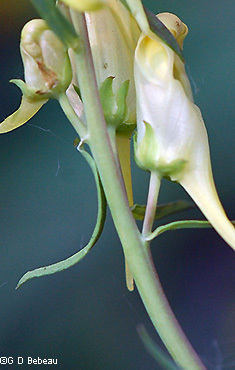 Below: The flowers erect upper lip has 2 lobes and the lower has 3 lobes, one of which forms an orange-yellow obstruction to the throat of the corolla. At the bottom of the corolla tube descends a nectar spur. The green calyx has 5 unequal lobes. Below: The narrow leaves appear to have a short stalk, but it the base directly attached to the stem. The underside is very pale with very fine surface hair and a pronounced convex mid-vein. Stems are thin. Below: Upper and Mid-stem leaves (top leaf) are longer by more narrow than the lower more basal stem leaves (bottom leaf). Below: Drawing courtesy Kurt Stüber's Online Library. Notes: Butter and Eggs is a European import from settlement days, now naturalized in Minnesota. Eloise Butler's Garden Log notes she acquired some plants as early as 1911 and later, such as 24 roots from Glenwood Park on Sept. 8, 1917, and from the Riverview Heights area of the cities on Oct. 15, 1923. Eloise had difficulty establishing the plant in what is now the Woodland Garden. Her expression was that she "could not acclimatize them but would try once more." When back in Malden, MA during the winter of 1932-33, Eloise sent a clump to her friend Gertrude Cram with instructions to heel them in until spring. Unfortunately, Ms. Butler passed away soon after her return to the Garden the following Spring and Mrs. Cram wrote to new curator Martha Crone at the Garden that she had those plants plus a yard full of them, from which Eloise "might have had an armful." (Letter of Gertrude Cram to Martha Crone, April 23, 1933.) Martha herself, planted 125 of them on 2 dates in 1945, more in 1952 and seeds in 1954. Butter and Eggs does survive in the less moist Upland Garden and most people who know the plant have probably seen extensive outcrops of them in the waste areas, street right-of-ways and pathways where it can get sun exposure. It is an invasive plant, listed on the Minnesota Invasive Plant List (and by a number of other states). It is a problem in prairie restoration if it becomes established. Unfortunately, it is still sold as an ornamental plant. The population in the Garden is kept under control and the plant is tolerated as an educational specimen. In Minnesota, Butter and Eggs is found in about 2/3rds of the counties, most absences being in the southwest quadrant. In North America it has been found in all states and provinces. In large concentrations, frequent mowing weakens the plant, 2,4-D broadleaf herbicide works and there are two known European beetles that feed on the buds. Eloise Butler wrote: "Some naturalized plant citizens, with attractive flowers, one might like to have in the garden, if they were not so aggressive. But, if admitted, they would selfishly shoulder out the weaker and possible more desirable inmates. The place for such vagrants is, therefore, the roadside where they will thrive on a hard bed and a crust of earth. Bouncing Bet and Butter ‘n’ eggs may be cited as examples. A blue ribbon should be awarded them for certain sterling qualities. During protracted droughts, when other vegetation has succumbed and even the grass blades have shriveled, they alone put out their blossoms and brighten what would otherwise be a bare and desert waste. 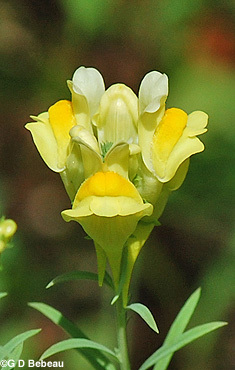 The pale and the deep yellow colors of the flowers of Linaria vulgaris, so well set off by the slender, sage green leaves, are aptly characterized by the rustic name, Butter ‘n’ eggs. The nectar held in the sharp pointed spur lures the humble bee to the lips of the blossom, stubbornly closed, as in the related snapdragon, to other insect rovers." Published Aug. 6, 1911 Minneapolis Sunday Tribune.